This paper presents a qualitative case study of upwardly mobile urban young men from the lower strata in Panajachel, Guatemala, who work to finance their own secondary schooling. 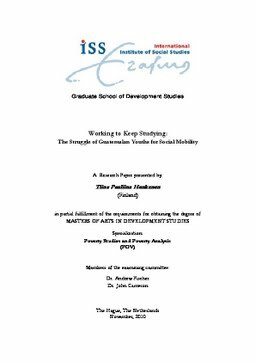 The case study reveals that engaging in privatised and stratified schooling requires sustained, holistic efforts that have potentially damaging effects on the individual, making their pursuit of mobility potentially impoverishing. These men continue to pursue schooling despite these effects because they are persuaded by a myth of education that is globally, nationally and locally cultivated, as well as conditioned by a reality where education is the main, if not the only, available channel of mobility. As schools monopolise the right to produce mobility and are privatised for profit production, there is a risk that poor students be exploited based on their commitment to the education system that benefits some and disadvantages others with the help of body and soul of those ultimately disadvantaged. -- Relevance to Development Studies -- This paper on young men who work to finance their own secondary schooling in Guatemala questions the global push for expanding access to education, which rarely questions the level of privatisation and stratification of education in developing countries, and which can cause the incorporation of the poor to schooling to have adverse effects. It also questions the focus on education and individual mobility as the main means of reducing poverty arguing that these cannot change fundamentally unequal social structures. The paper studies working and studying youth who have not received scholarly attention, the experiences of whom can help us re-evaluate the policy options for expanding secondary education in the wake of the universalisation of primary schooling.